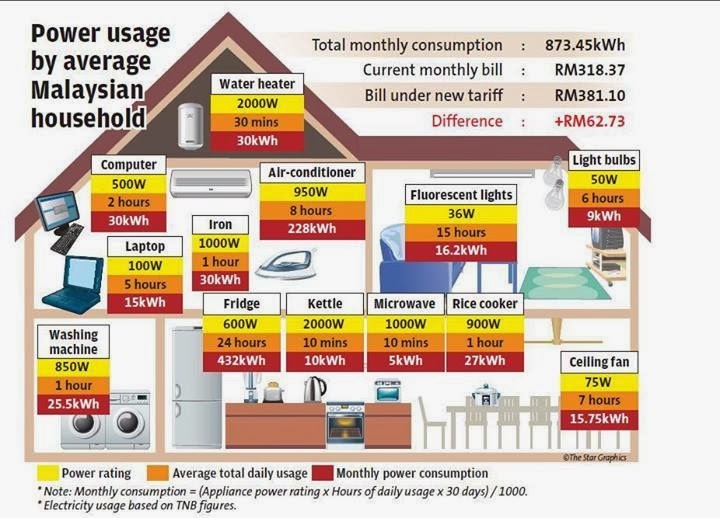 70% is more than half population will not affected by Electricity tariff change that will be effective January 2014. In line with government initiative reducing energy subsidies, Tenaga Nasional Berhad introduce new tariff in order to materialised the government's subsidy rationalisation programme. TNB further claimed that there are no increase in eletricity bill for most of the Malaysia population. It is clearly stated that the RM20 rebate from government is still in effective and not being taken out by the introduction of new electricity tariff. It is rest assured to say the impact of new electricity tariff is not targeting most of us. So, who are the one will be impacted the most by this new implementation? According to the TheStar news agency, it reported that most of the time shopping mall operator suffers the most because the fact to run a shopping mall, single and biggest expenditure derives from electricity bill. Representative of Malaysia Shopping mall Association and Highrise complex Management President H.C.Chan said 16% increase in industrial category electricity tariff was too steep and the shopping mall operator would have to pass down the increased costs to consumers, which would lead to inflation. National's Energy, Green Technology and Water Minister Datuk Dr Maximus Johnity Ongkili commented on 2014 electricity tarff, consumption of electricity not pass 300kWh will not be impacted by new tariff. Besides, consumer spend 300kWh and below the price is ranging from Rm43-Rm77 capped. 300kWh-400kWh, the fee need to be paid ranging from Rm77.52 - RM128.60 . formerly the price is Rm77.48 - RM117 capped. In other words, it is ideal using between 200kWh - 300kWh for no further increase electricity bill. The bill will be capped on RM77. Unitedmy comments on electricity tariff 2014 - I am looking forward how industrial and commercial cope with this electricity bill increase. I think every price tag of goods and service will be increase. Inflation is a good tool to wipe out poverty stricken family and enrich companies by the name of progression nation and national agenda.